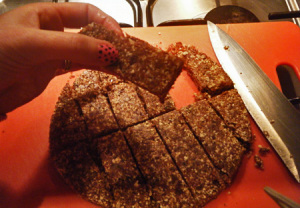 A very easy recipe today – Date and nut crumble. A perfect snack to pop into your lunchbox. Add all ingredients to a food processor and blend until a coarse paste is formed. To check if blended enough, squeeze a bit of the mixture between your finger and thumb. The mixture should bind together. Spoon the mixture into a lightly greased baking tin (I used a round one with a 9 inch diameter) and press down. Lightly grease the underneath of an identical baking tin and press down hard on the top of your crumble. Add a weight to the top of the baking tin (I used a large jar of golden syrup) and leave in the fridge for at least a couple of hours, but preferably overnight. Remove from the fridge and take off the top baking tin. 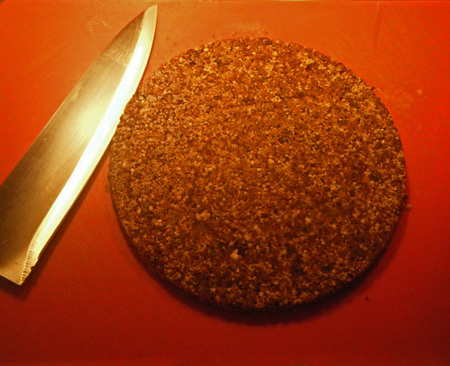 Turn upside down onto a chopping board and gently tap the bottom baking tin until the crumble drops out. I individually wrapped mine up in tinfoil so I could take one to work each day. Be careful – they can be slightly messy to eat!